Our Food Distribution is for EVERYONE. 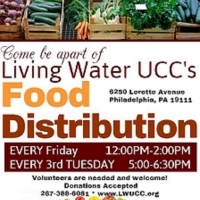 Please bring a bag or 3 to carry out fresh produce, breads, meats, and non-perishible items. ALWAYS FREE! On occasion we also have clothing and small kitchen items (new and gently used) to giveaway. ALWAYS FREE! Volunteers are always needed and welcome 1 hour prior to Food Distribution.